Our Topic this half term is Arctic Adventures. In history we will be looking at Inuit life, as well as different Arctic explorers. In Art we will be looking at Arctic landscapes. In DT we will be designing, testing and evaluating Inuit boats. In PE we will be looking at Inuit dance and dance sequences. We look forward to uploading lots of pictures and keeping you up to date with what we get up to in Year 2. We had a brilliant day in Year 2 marking 100 years since the end of the war. The children came dressed up to school as evacuees and soldiers. The children decorated poppies and made persuasive posters to recruit soldiers. Year 2 had lots of fun celebrating Halloween. We played the flour game, where children had to use only their mouths to find the sweets. Then we did apple bobbing and made chocolate apples. The children really enjoyed their day. Year 2 were very lucky to have a visit from Sue Cove in September, who taught the children 'The Story of Charlie' through images and talking. The children have then practised these stories and performed them. We then used this as our model and the children adapted them and wrote their own version of the story. Here is our display showing the children's story maps. Welcome to Year 2 2018 - 2019! We have lots of exciting things going on in Year 2 this year. We are starting with the topic 'Arctic Adventures'. We will be exploring what life is like in the Arctic now compared to life years ago. As a class we will also be exploring Inuits and their way of life. In science we will be exploring animals including humans. As a whole school we will also be looking at WW1 to mark 100 years since the end of the war. 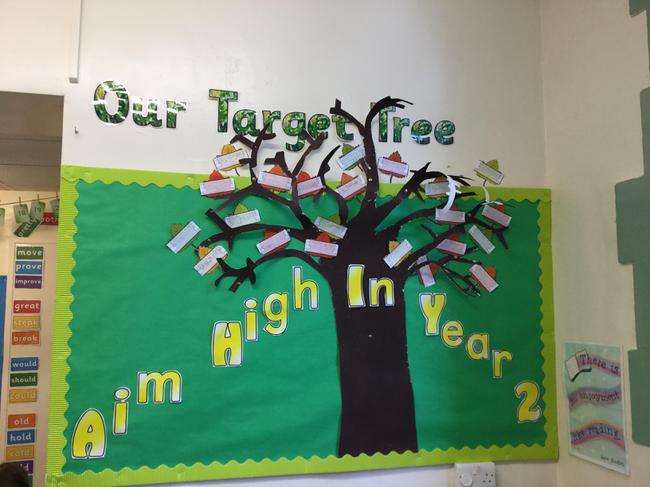 In year 2 we like to aim high and we have set ourselves some targets for this half term. We are all working really hard towards meeting these targets. 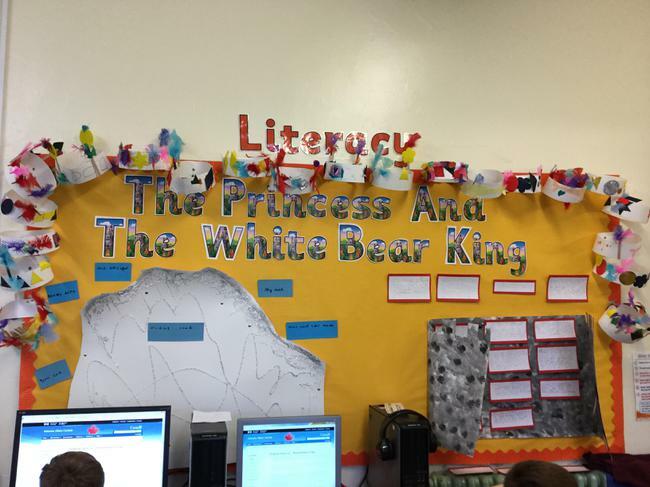 Our book we have been focusing on this half term has been 'The Princess and White Bear King'. The children thoroughly enjoyed this book and producded some fantastic pieces of work including, diary entries, character descriptions, imaginative stories and made some super crowns. Here is our display. Our new power of reading book 'How to find Gold' is linked to our new topic 'Castles'. This week the children have been busy making sea monsters, using a range of different materials. Following on from this the children worked collaboratively in pairs to write instructions about how they made their sea monsters. The children had a fantastic morning playing out in the snow. They built snowmen and had snowball fights. We are moving onto our new science topic, living in habitats. We started this unit by exploring what we already know. The year 2 children were lucky to have a visit from 'Freddie Fit'. The children loved the activities and competing against each other. We look forward to bringing some of these activities into our weekly PE lessons. The year 1 and 2 children took part in the Christmas performance of Baubles. The children worked really hard learning their lines and the songs. The children were fantastic. This half term we have been looking at what life was like as a Victorian and comparing it to life now. We have looked at hospitals and the differene in facilities and resources nowadays. Also we have looked at Florence Nightingale and the impact she had. We then went on a school trip to Beamish to find out what a Victorian school was like. We also looked at the homes and shops along a Victorian street as well as experiencing a Victorian style fun fair. Some children even got to meet Santa and his reindeers. Here is an overview of all the objectives we will be covering in Year 2. Some children from Year 2 took part in a football tournament at Netherhall School. The children played exceptionally well and won every match they played. They celebrated each goal scored in their own unique style, sitting on the floor and doing a celebration wave. A huge well done to the team. This year we celebrated World Book Day by coming to school dressed as our favourite book characters. We brought in our favourite books and took part in a whole school book swap. We took part in various competitons throughout the day. We enjoyed coming to school dressed in red and pink for Valentine's Day. We made Valentine's cards and buns. We have been imagining that we have visitied Antarctica and writing postcards to family and friends about our experiences. We have created a display of our work. As part of our author week on Roald Dahl the children became engrossed in Charlie and the Chocolate factory. We did lots of writing, with a focus on language choices to create effect. To finalise our work we invented our own chocolate creations. Welcome to the Spring term. We hope you have had a lovely Christmas break. This term our new topic is Fire and Ice. During the first half term we will be focusing on Ice as this fits nicely with the winter season. During our literacy work we are going to be focusing on information texts. We will be mainly researching the Emperor penguin whose habitat is on the coldest and windiest continent on Earth, Antarctica! During topic work we will be reseaching the Polar regions. We will compare the Polar regions and discuss weather, landscapes, people and animals. We will also be looking at some people who have braved the harshest weather conditions of the Polar regions and their challenging expeditions to reach the poles! During Science we will learning about animals including humans. Our maths this half term will focus on shape, sorting, number and place value and addition. As part of our design and technology we will be making hand puppets using sewing techniques. Our PE this half term is learning tag rugby skills. In RE the children will be looking at bible stories and the morales of them. A part of our topic 'A long time ago' we studied the Victorian period. We looked at who Queen Victoria was, what life was like for some Victorian children and the Victorian Christmas. Queen Victoria's husband, Albert brought some Christmas traditions to our Country, in particular, the Christmas tree. To help raise money for Children in Need this year we came to school dressed in this years theme of...Spots! We were even lucky enough to win a visit from Pudsey Bear. We sang for him and he judged our competition for the spottiest child in each class. We did lots of activities in class throughout the day. We even decorated spotty cakes. As part of our local history week we have been to visit St Kentigern's church,which has been around for many years. The original church was built in the 6th or7th century and was awooden structure of Saxon origin. It was later replaced bya Norman church which was then taken down due to the growing population ofAspatria. In the late 1840's the church that sits there today was built. We then decided to look at the work of artist Sheila Fell (1931-1979) who grew upin Aspatria and even went to Richmond Hill School.She did lots of paintings ofAspatria and worked with quite dark colours. She often painted oil on canvas orcharcoal on paper. We created drawings of the church and came back to schoolto use charcoal to create work in the style of Sheila Fell. The children used lightand dark to create effect. They have produced amazing work that we will bedisplaying in class. During science week we have been learning all about light and dark, includingidentifying natural and man-made sources of light, learning how shadows arecreated,looking at materials which do/do not allow light to passthrough and categorising these into materials which are opaque, transparent and translucent. We have investigated the difference between light sources and reflections of light and carried out an experiment to test what kind of light we need to see reflective things more clearly. We found out that reflective materials are seen best in the dark with a light source is shining on them. We have also made shadow puppets for well known stories and performed theseto the class. Please find attached Year 2's newsletter for the autumn term. Myself and Mrs Jameson are looking forward to the year ahead and getting to know the children of year 2 and their parents. As part of our design and technology work we have been looking at how vehicles move. We then designed and made our own moving vehicles. Year 2 have been busy measuring this week. We have been measuring length, mass and capacity. This half term we will be reading The Lonely Beast in Literacy. We will be using this book to write diary entries, stories, letters and poems. In maths we will be continuing to develop our mental arithmetic skills using addition, subtraction, multiplication, division and fractions. Will also be deepening our knowledge of shape, measures, time, data handling, place value, addition and subtraction and multiplication and division. In our topic work we will be continuing to investigate the past by looking at significant events and people. We are learning about Samuel Pepys and The Great Fire of London. As part of our Design and Techology we are now beginning to design and construct our own moving vehicles. In PE we will be playing Games, running over distances and continuing our tag rugby skills. ICT will be following our Coding unit. Well done to Kieran for winning the class egg dump and making it through to the whole school final! Reception, Year 1 and Year 2 held a competiton to construct an Easter bonnet using various crafts. The children demonstrated creativity and imagination throughout the activity. They created fantastic bonnets and loved showing them off in our Easter parade in St Kentigerns church. Year 2's winners were Brooke and Daniel. To raise awareness of the importance of buying fairtrade products to help farmers and workers get a fair price for their products we held a coffee morning for parents and the local community to come and buy cakes, that we had made using Fairtrade ingredients. Year 2 made banana and chocolate chip muffins and crumbly banana squares. The children can now identify fairtrade by the logo found on products. Thank you to everyone who supported us in this event. Year 2 enjoyed listening to stories from around the world today. These were told by storyteller, Emily Hennessey. The children were really engaged and had lots of fun. Emily brought the stories to life, grabbing the full attention of the class. We have really enjoyed learning about sculpture. We have researched different kinds of sculptures and what they can be made from and we have looked at sculptures around our school. We even attempted to make igloo sculptures using marshmallows and icing sugar. We had to work as a team to talk about how we were going to construct these. Half way through we stopped and went to look at the creations from other groups to see if this gave us new inspiration or maybe even made us completely change our designs. When we completed our sculptures we quickly took some photographs before enjoying our sculptures as a tasty treat! The following week, for homework we collected recycled materials to design our own emperor penguin sculpture. We brought the materials to school and began thinking about how we were going to assemble our sculptures. This was quite a tricky process. Then things got messy! We used paper mache to strengthen our sculptures. Next we will be painting and adding different media to our work to finalise our sculptures. We have learned that sculpture is all about using your IMAGINATION. Year 2 enjoyed a drama workshop with Becky. The children enjoyed acting out a scene at a picnic. They had to imagine that different events happened whilst they were there, such as; a gate being left open with cows escaping and being chased by bumble bees. They all had lots of fun! Storyteller Ian Douglas came into school to tell the children a story about War. The children created a giant for their story. They had to work as a team. The children were really engaged and Ian was very enthusiastic. The children answered lots of challenging questions and demonstrated good understanding. Literacy - information texts, fantasy stories and instructions. Maths - Numbers and place value, addition and subtraction, weight and time and multiplication and division. Topic - Our topic this half term is a geography focus called 'Where we Live' We will be comparing the United Kingdom with Antarctica. We will be locating these on maps, looking at the human and physical features and weather and climate. We will be using where animals come from as our inspiration into these locations. Science - Why Would a dinosaur not make a good pet? Happy New Year. We hope you have had a lovely Christmas. Year 1 and 2 worked really hard to learn lines,songs and performance skills to put together this year's Christmas production 'Sugar Plum'. This production reminded us of the importance of family and friends at Christmas time. There was lots of laughter and the performance was enjoyed by all. The staff are extremely proud of the effort all children gave to the performance. We would also like to thank parents for help with costumes and learning roles at home. Year 2 loved learning how to Street dance. The street dancers taught us some dance moves and how to sequence these to create a short street dance routine. We looked really cool! We really enjoyed having our family in our class to make Christmas crafts. We made gift bags which we took home at a later date with a decoupage decoration in that we created. We also made hanging star photo frame baubles for our trees at home and lollipop stick decorations of snowmen, Santa's and reindeer. Year 2 enjoyed a visit from a professional gymnast to raise money for the school. The children enjoyed taking part in fitness activities and watching the gymnast show off his skills. He taught us about the importance of a healthy diet for professional athletes. We had a fantastic day. As part of the annual UK-wide film festival and year-round programme of cinema-based screenings and events, children and young people have the chance to explore and develop their understanding of film. Watching films in the communal environment of their clubs or enjoying the wonder of the big screen at the cinema, children experiment with different genres, eras and styles and in doing so develop a lifelong relationship with film. Watching films plays a key role in helping young people examine their lives and the world around them, and discover cultures beyond their own This Year Years 1 and 2 went to the cinema to watch Cinderella. They were learning about kindenss and courage. We will be following this visit with Traditional Tale writing in our literacy work. The children really enjoyed the film and it was lovely to hear then discussing their views and feelings with others. 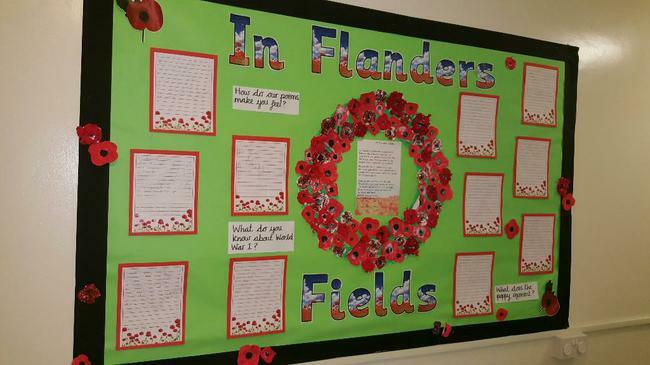 There has been a whole school focus this week learning about World War 1 and Remembrance. The children had a visit from Tommy to talk about life in the first world war. He showed the children lots of pictures and artefacts and the children even got to dress up in a soldiers uniform, gas masks and hold some of the weapons used in the war. This was a fantastic learning opportunity for the children and they have been really enthusiastic to learn more about the war. We have been making poppies to create a remembrance wreath and creating our own poetry based on 'In Flanders Fields' by John McCrae. We have studied the countires that took part in the first world war and created propaganda posters trying to persuage people to join the army. We will be continuing our learning of World War 1 over the next half term during our topic work. In Literacy we will be focusing on Poetry (World War 1 and bonfire night), Traditional Tales (Cinderella - We have an exciting trip to the cinema planned) and Information texts. In Maths we will be learning about shapes, sorting, addition, number facts and patterns and subtraction. In Science we are continuing our learning on Materials and what our school is made of. We will be learning painting skills in art to create Remembrance themed pictures. PE will be practising throwing and catching skills and gymnastics. In RE we will be focusing on stories from the bible and the Hindu festival of Diwali. We will be focusing on handwriting skills to improve presentation of writing. This half term we have been practising our sewing skills in order to make a glove puppet. The children worked really hard and came up with some really good puppet designs. When it came to assembling their puppets the children amazed me with their sewing skills. They produced fantastic puppets and were really proud of their work. Year 2 enjoyed a step back in time on their trip to Beamish on Wednesday 14th October. It was a long journey on the bus but we had a fantastic day. We started the day with a Victorian lesson. The teacher was really strict and made us call him sir every time we spoke. We worked on slate to write words and work out sums. We had to recite a poem and draw whilst listening to a story. The teacher discussed all the forms of punishment that children would have experienced. The whip was very loud! Mrs Kyffin had to pretend to have the cane across her fingers and Kieran's Mum had to do the mark of shame and rub her nose in chalk on the chalk board. Everyone thought it was really funny. After the lesson we went for lunch and a trip down the mine. We had to wear hard hats for safety. It was really dark and wet down the mine and a very small space for a lot of people. We couldn't believe children as young as us had to work in those conditions. It was quite scary. Following the mine we went for a walk around the cottages to compare homes in the past with our homes. We then took the bus to the town. The bus ride was exciting. It was a double decker bus. Whilst we were in the town we visited the dentist, newsagents and printing shop and the sweet shop. The smell of sugar was really strong. We all got to try cinder toffee. Finally we took the tram back to the village to end our trip with a visit to the gift shop before the long journey back home. We learned lots about the past and had lots of fun at the same time. In maths we have been learning how to measure using a ruler. We have been measuring objects in the classroom and sorting them into groups depending on how many centimetres long an object is. We have also been continuing to develop our understanding of position and direction after our beebot workshop. We have been learning how to make whole turns, half turns and quarter turns in clockwise and anticlockwise directions. We have worked with partners to give instructions to move ourselves to different places around the classroom and we have used maps to direct robots to different locations. We have been using the language; left, right, forwards and backwards. Year 2 have been writing their own stories. They have been writing them on whiteboards and then editing them to make sure they are happy with them. We then wrote then up into our books. Their work has amazed me! There are lots of mischevious animals in their stories. Year 2 loved having their parents in class to read with them and chat about books. I hope you found it useful in helping develop children's comprehension skills. We look forward to seeing you at the next session. The children enjoyed taking part in this years virtualy live Roald Dahl webinar. This Year it was all about the Twits and their tricks. Questions were answered LIVE by Roald Dahl's official biographer Donald Sturrock. We also learnt to draw like Quentin Blake. Year 2 enjoyed juice and a cake this morning whilst fundraising to support the Macmillan Cancer Charity. The school raised over £500 from children in school and the local community coming to support our coffee morning held in the school hall. Today STEM Cumbria visited us to help us investigate beebots. We had lots of fun investigating what the beebots. We learned to program them using positional and direction language such as forwards and backwards, left and right and quarter, half and full turns. We used the floor beebots and then looked at some computer software that uses the same functions. After that we used floor maps and had to figure out how to program our beebots to get to different positions on the map. It was really interesting and we were really good engineers for the morning. We earned a certificate for our work. This week in literacy we have been planning our own stories. We have created characters that might be hiding in a broom cupboard under the stairs. We gathered our inspiration from the story of The Lion in the Meadow and You Choose. We picked a new character and then wrote a description of it for others to guess who is hiding in the broom cupboard. To go with our piece of writing we drew our character and made a cupboard to hide it in. 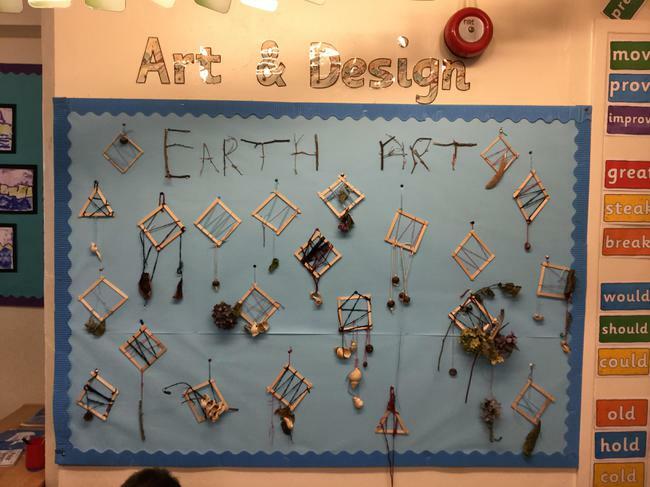 We love our ideas so we wanted to share them with everyone on a class display. Year 2 have been out in the local area taking photographs of Aspatria. We took the tablets onto Queen street to take lots of images of what Aspatria looks like in the present day. We are going to be comparing these with pictures of Aspatria 100 years ago. The children were very excited and loved taking their own photographs. 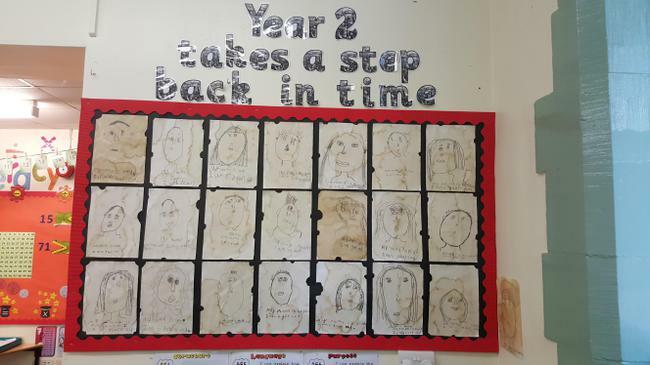 Year 2 have produced some art work of themselves using charcoal to create the effect of an old self portrait. I hope you have all enjoyed your summer holidays and are now ready for a new year at Richmond Hill in Year 2. Mis Winthorpe, Mrs Veitch and Mrs Jameson are extremely excited about the year ahead. We look forward to getting to know you all. Here is an overview of the first half of the Autumn term. In Literacy we will be writing stories with familiar settings, postcards and letters and poems with repetition. In Maths we will be learning about place value and number sequences, number facts and counting and time and money. During our topic work we will be learning about life 100 years ago, what it was like as a child in the Victorian period and we will be visiting Beamish. To locate our school, please the use the map above. Please use the menu on the left to access information about each of the classes in this year group.